HUL is on a Facebook Application overdrive for its brands. Here is an update on the latest from its beauty brands Dove and Pond's. Dove Skin’s latest Facebook application promotes New Dove Mini Lotions. The new range of Dove Mini Body Lotions is a practical option for winter skin care. It gives you the option to sample the variants and is also a handy carry-along. 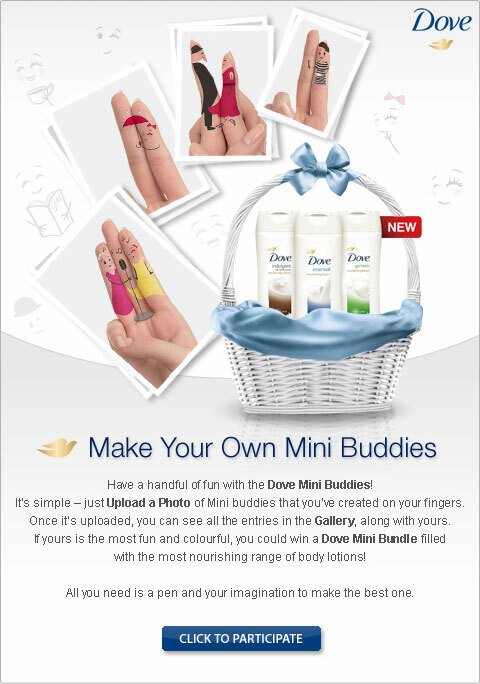 The campaign imagery employs finger art that the brand calls ‘Mini-Buddies’ and therefore the Facebook Application pulls that thought forward and asks fans to upload pictures of creative and fun finger art with Dove Mini Buddies and the best entries stand a chance to win a Dove Mini Lotion hamper. So will the next Miss India be a Facebook Contest Winner? If Pond’s has its way, Yes. 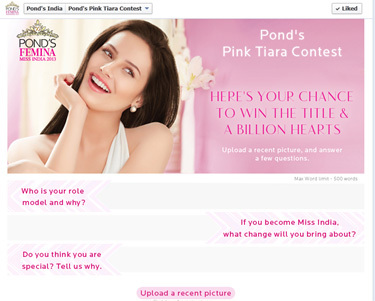 In a bid to advertise its association with Femina Miss India 2013, Pond’s is promoting a ‘Pink Tiara Contest’ on its Facebook Brand Page that reaches out to more than 3.6lakh fans. The Contest App is simple, you need to upload a picture and answer some predictable Beauty Contest templatised corny questions and pray that you are lucky (if you fancy pink tiaras, that is)! Out of these two, Dove is a clear favourite only for lack of a better choice.